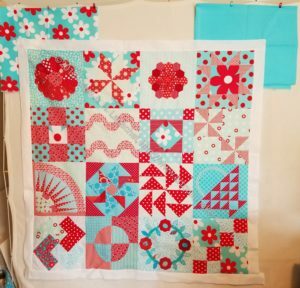 I worked hard on the Aqua-Red Sampler quilt over the weekend. It was great to have a nice long weekend. I made a lot of progress and will be glad to get this quilt out of my hair. You will notice that I rearranged the blocks since my last layout. I also did not include the Cathedral Window block. It was just too thick. I have another test block from this quilt and I think I will make a pillow from the two of them. I made a new block and needed to rearrange the blocks because of the colors. 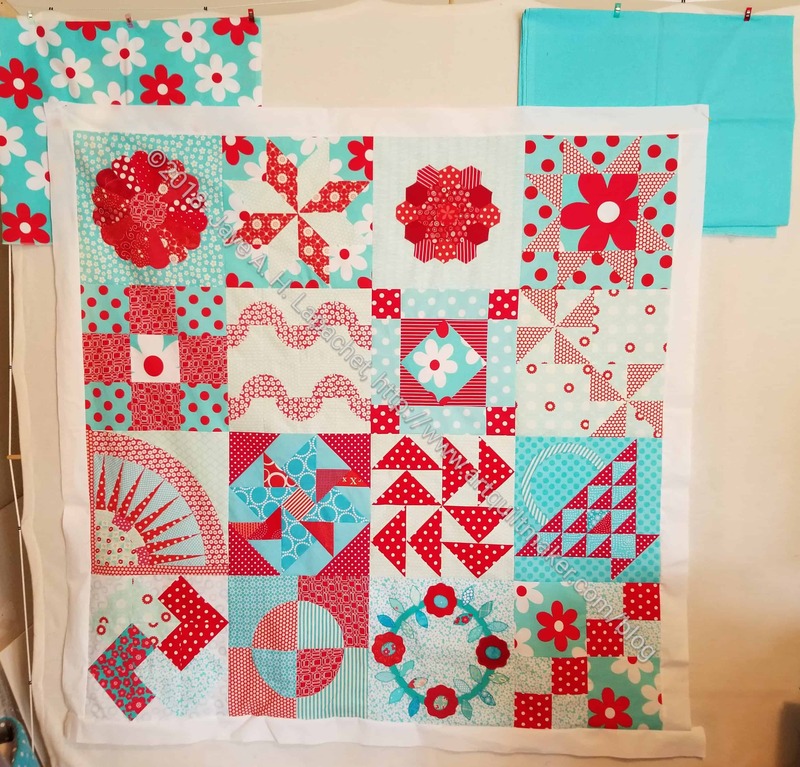 I didn’t want all the big red dots and daisy fabrics lumped together in one area. This quilt has been one problem after another and I hope that the borders will cut me some slack. I found a bright white (Pure Elements Snow, which is different from Kona Snow) that picked up and highlighted the other bright whites in the blocks. I tried not to include too much cream where possible. I’m not sure about the width of that white border (2.5 inches). I may rip it off and make it smaller. That is not my first choice. I thought the daisy fabric would be exciting, but I would have to struggle with making sure I used every scrap if I can’t find the rest of the stash of it that I know I have somewhere. The solid turquoise would be a solid choice. By that I mean that it would work, it would probably hold in all that is going on in the quilt. If you want to make that first border smaller, couldn’t you just trim it instead of ripping it off? And I’m a big fan of the floral border. Maybe the solid font binding? I don’t have a big enough place to cut the border once it is on the quilt. I have tried that before and my small cutting table doesn’t work for it. We’ll see what happens.